Express facial. Make-up Artistry. April 2019 specials!! pure luxury. pure pleasure. purely affordable.ure pleasure. pure luxury. purely affordable. Purely You! Marketing e-Learning System for 50% off! Marketing E-Learning System Discounted for Broomfield Chamber Members! We offer free 30-40 minute presentations that not only introduce FranklinCovey's The 4 Disciplines of Execution, but give your team tools and practices that they can implement immediately to improve their ability to execute on their highest priorities. Free "Lunch and Learn" or other organizational presentation, learn about improving execution on your highest priorities. We offer free 30-40 minute presentations to introduce FranklinCovey's The 5 Choices for Extraordinary Productivity. Free Productivity "Lunch and Learn" or other organization presentations. We offer free 30-40 minute presentations to introduce FranklinCovey's The 7 Habits of Highly Effective People. Free effectiveness "Lunch and Learn" or other organizational presentation. We offer free 30-40 minute presentations from the Partnership for Drug Free Kids to increase understanding of the issue of heroin and other opioids so that we can come together to take action for our community. Free Opioids in your community education "Lunch and Learn" or other organizational presentation. Use your tax refund to invest in your child’s smile… or yours! 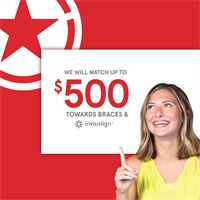 Smile Doctors will match your down payment up to $500 towards Braces or Invisalign®. Buy or sell a home with Julie and get a $100 Home Depot Gift card at closing! It seems like every time one of my clients buys, sells, or invests in real estate, they end up making multiple trips to The Home Depot to make repairs or upgrades to their properties. 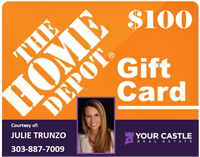 I'll help you out by giving you a $100 gift card to The Home Depot upon closing on your property! Whether you or a friend would like to buy, sell, or invest - I’d like to be your trusted adviser! Try out a free day of hotdesk coworking at Work At 26! Please call 720-501-2388 to make your reservation. Come try out a free trial day at our new coworking facility! Spring promotion at Work At 26! Come in for a complimentary trial day and receive a business week of hotdesk coworking - FREE! Come in for a complimentary trial day and receive a business week of hotdesk coworking - FREE! Your choice of a Home Warranty or a $500 Credit at Closing!